The second-largest city in Sweden, and Scandinavia's most important port, Gothenburg (or Göteborg) is situated on the west coast of the country, at the outlet of the Göta Canal which links Gothenburg to the Baltic Sea, and indirectly to the country's capital, Stockholm. Gothenburg was founded in 1621 by King Gustav II Adolf to secure access to the Atlantic, but the city was settled and planned by Dutch merchants who used it as their base for trade. The numerous canals and gabled houses are evidence of this early influence. 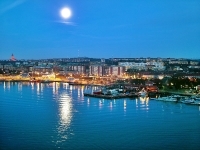 Shipping and commerce have always been important industries in Gothenburg and the port is a popular arrival point for visitors. Gothenburg is a beautiful city with its waterside location, green open spaces and fine architecture, and a wide selection of cultural establishments. The main street, Kungsportavenyn, known simply as Avenyn, is alive with edgy bars, cafes, and trendy shops - which point towards Gothenburg's status as a more down-to-earth, youth-driven city than Stockholm (Gothenburg still has its fair share of sophistication, but is certainly more grounded than the capital), augmented by the large student population of the University of Gothenburg. While certainly not as magnificent as Stockholm, Gothenburg is often regarded as friendlier and cheaper, and certainly has enough going on to keep even the most energetic travellers occupied.